8CUPS has created a new stainless steel bottle and carrying strap that provides a more elegant way to carry your favourite brew. 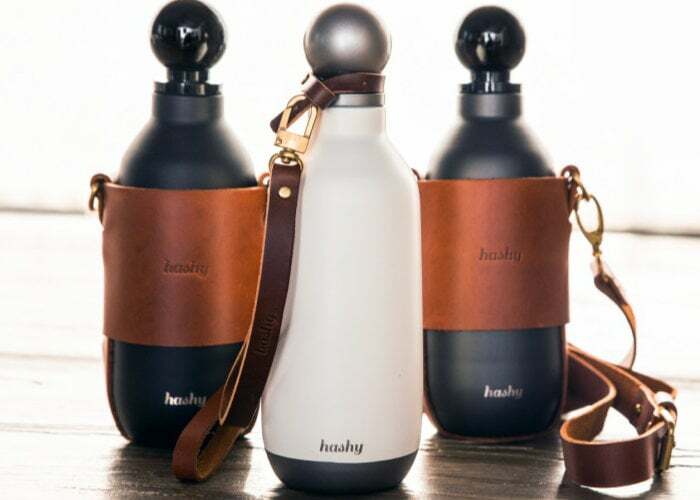 Hashy Bottle has the capability to carry both hot and cold drinks, and has the option of different straps, depending on your needs and requirements, and offers both shoulder and bracelet in leather. Stay perfectly hydrated throughout the day, sporting a simple style and elegance that will encourage you to reach for a refreshing splash of delicious water when you're thirsty. - Health in mind: Drink with confidence. Do it well for your body and planet by keeping yourself hydrated with a reusable water bottle. With a reusable water bottle, it is easier to drink more water and improve your overall health! - Carry your bottle wherever you go: Hashy's handmade leather makes it easier to keep the water bottle at hand. They would be the perfect water bottle kit for your active, on-the-go lifestyle. - Durable and strong leather accessories: Waterproof and classic saddle brown leather accessories ages natural and beautiful. Opening day promises start from $23 or about £17 and will be available for the next 37 hours, upon which price will increase. Worldwide shipping is expected to start in June 2019. So what are your thoughts on this gadget? Comment down below!